Number crunching done, let the Fabric Fly! For the past two and a half years, there has been one Wednesday every month which ALWAYS feels like a Friday. I know it’s coming, I plan for it, my job is scheduled around it, so it’s no surprise. But when it comes – I know that for at least a few seconds I will think it is Friday. That Wednesday is today. I have finished closing the accounts for another month and submitted it to the higher authorities. I am an accounting manager by day and a mother, wife and quilter by night/weekends/lunch breaks. I truly love working with numbers and it does fit me perfectly, but the sense of relief to get through the close is always a good cause for celebration. So,… I will treat myself to extra quilting time tonight! I have stuck with my goal so far this year to do some quilting every day. Last night, I finished up my alternate Block 1 for the Blogger Girls BOM. My husband graciously snapped a picture for me from home this morning since I forgot to take one last night. What do you think? My husband said … “Those don’t go together, do they?” The blue and greens are throwing him off. I’ll have to evaluate how they mix together as I go along. Perhaps it will end up being a reversible quilt? I actually think they look good and I’m sure they will be fine altogether in the quilt top. 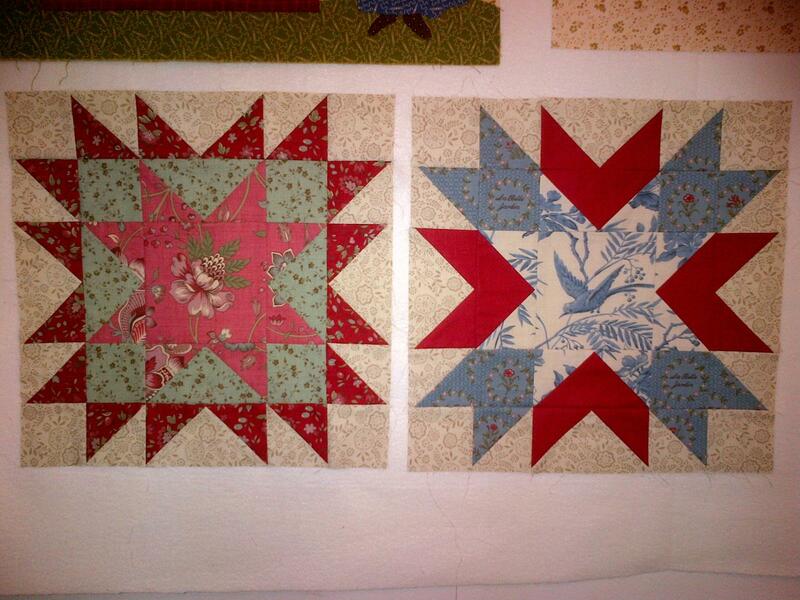 Reminder… these two blocks are made from the same pattern, just different fabrics. The idea is to mix them all in the same quilt so it appears that you have all unique blocks. Done! Tonight… I work on Block #3 of my Away from Home BOM, which are two panels that will be all applique. Two oak trees with lots of leaves. I kind of miss my applique time – so really looking forward to it! I have to go now and show my CEO what pretty numbers I have made this month! ← It’s not one thing … it’s another! I think they look great together! Love those fussy cut centers! Thank you! I usually do kits, so putting together my own fabric combinations is a bit suspenseful in regards how it will all come out.